There is something really fun about making large scale cross stitch projects. I started by doing some stitching and embroidery on canvas. My favorite was the cross stitch arrows canvas that I stitched. It combined the large scale cross-stitching with arrows and fit my word of the year I had that year. For awhile now I’ve been daydreaming about cross-stitching on a shirt or sweater. I think the idea really took hold one day when I was looking at my sisters thermal shirt and noticing the square designs that are part of those shirts. With built in squares it would be so easy to cross-stitch on them. But the project kept getting pushed back. 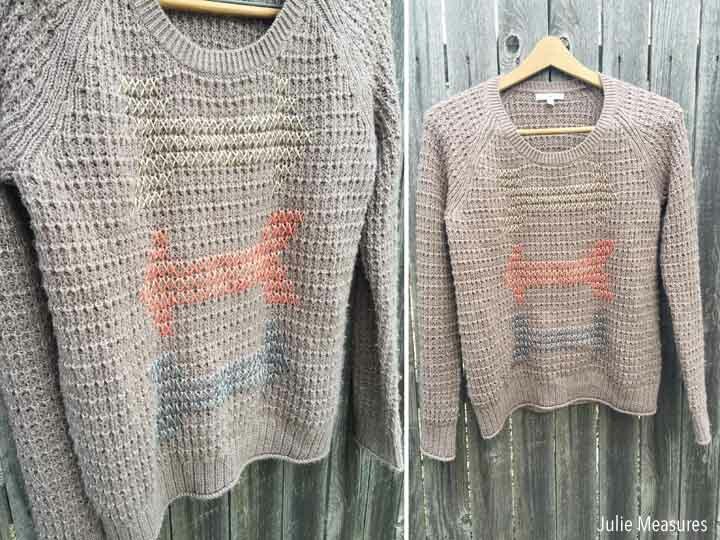 Then while I was at the store the other day I found this sweater that I knew was perfect for my wearable cross-stitched dream. 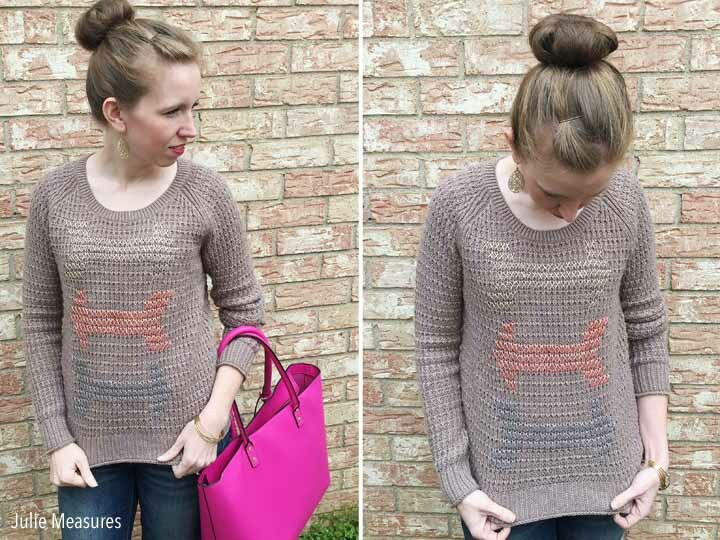 The sweater has some great loose stitches and pretty nicely defined little X shapes. I loved the idea that I wouldn’t have to sketch out the pattern on the sweater I could just cross-stitch on it like I would traditional cross-stitch fabric. 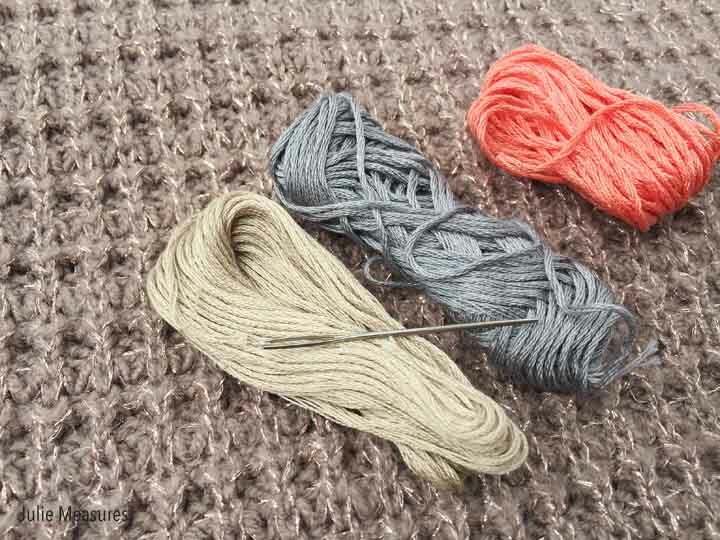 For my cross stitch sweater I used three different colors of embroidery floss, you could also use a lightweight yarn for this project. 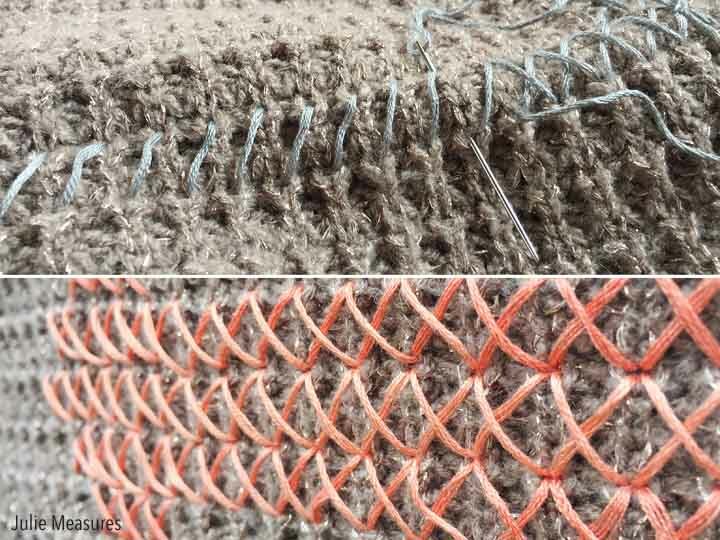 I found the center of my design and the center of the front of my sweater where I wanted the design to go. I picked a design that pretty much filled up the entire front of my sweater. And the colors that I picked, kind of a gold, silver, and rose gold, went well with the metallic threads running through the sweater. It hardly took any time at all, just a couple hours, to get everything stitched up and ready to wear. I’m still all about the arrows. It stuck after I picked Lead as one of my words of the year. 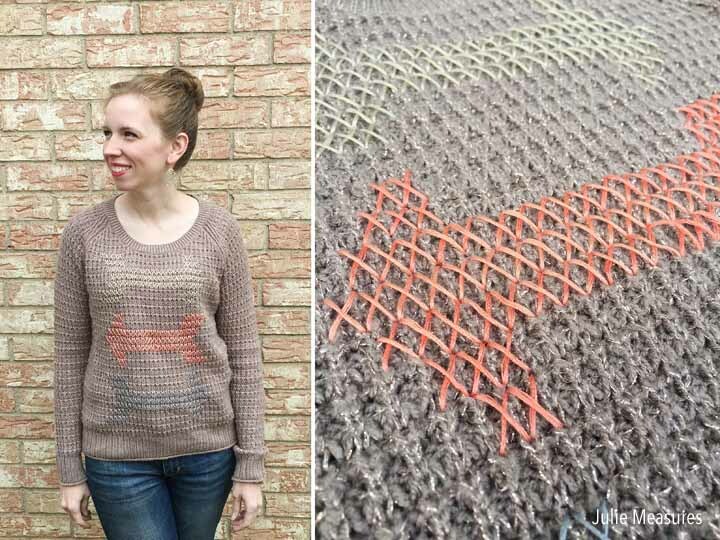 I used the same pattern of arrows from the canvas I had made previously for this sweater. 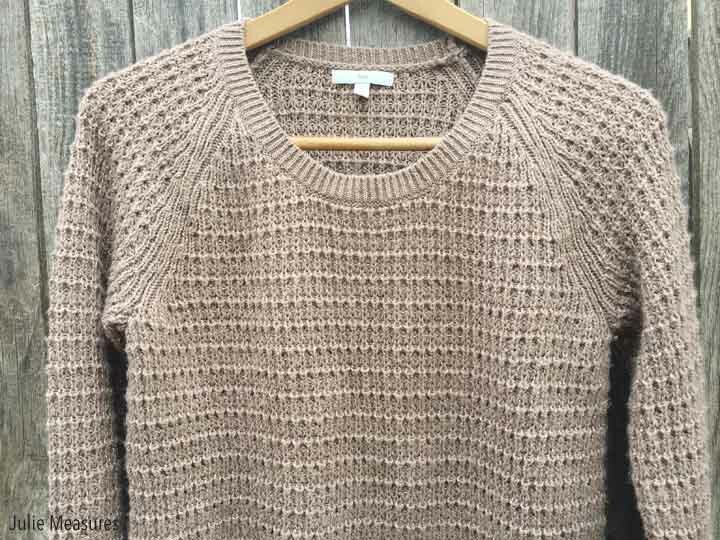 I’m so in love with this lightweight sweater! You’ll definitely be seeing me wear it all through the fall. I think I’m going to need to pick up a few more to continue my wearable cross stitch sweater making. 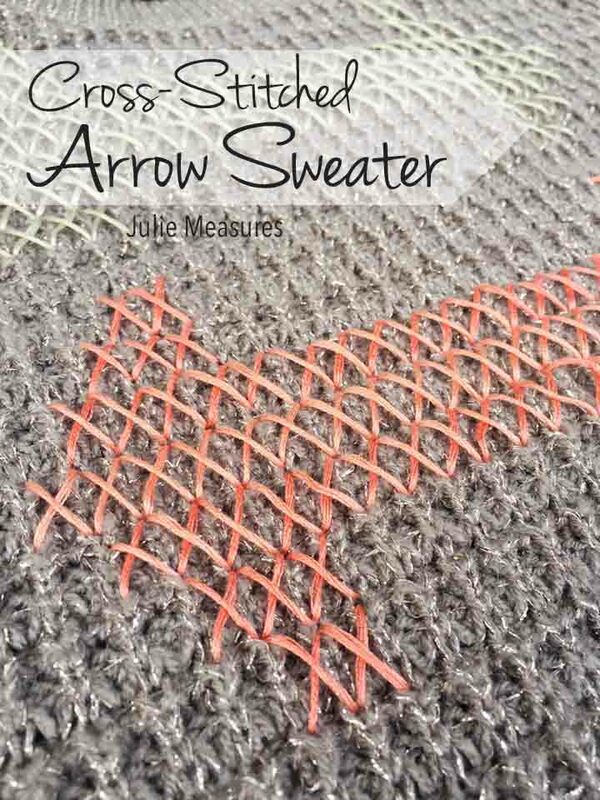 Looking for more arrow inspired projects? Check out my Yarn Arrow Wreath here.